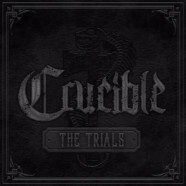 Crucible, the new side project put together by vocalist Dave Stephens and bass player Andrew Glass of We Came as Romans was birthed from the need to play something heavier than their current gig, WCAR, could offer. Stephens and Glass have thrown their chips in the air and recruited fellow Michiganders, guitar players Todd Jansen of Assassins and current WCAR guitar player Lou Cotton along with former Taproot drummer Nick Fredell. The Trials, Crucible’s initial offering, opens up with the title track, The Trials. Opening with transcendent layered guitar and bass lines gives the feeling that a thick fog has just rolled in. Stephens promptly splits that fog with his gritty and angst ridden vocals. The Trials is the tone setting track for an e.p. t hat grabs you by the throat and never relinquishes it grip throughout its entirety. The cherry on top are guest vocals by Brandan Schieppati of Bleeding Through, Davey Muise of Vanna, Landon Tewers of The Plot in You , Kyle Pavone of WCAR. Typically, I find myself guarded when a group like Crucible comes together and slides out of the shadows to feed their inner desire to play another genre of music. Not because they don’t deserve to feed that monster, more so, because I tend to play the comparison game and their latest project doesn’t live up to my own hype. Crucible DOES live up to my own self derived hype. In all honesty, I think that it’s better than the bands that put them in the spotlight. Bottom Line – I can only hope that Crucible isn’t a one off project because The Trials left me wishing that it wasn’t just an e.p.